I was over visiting at Mike's America. His latest post was clever. I just had to post a copy of it here. Harry Reid: Do You Like Green Eggs and Ham? Harry Reid: Where Will You Fight Al Queda? You won't fight Al Queda in Iraq. Will you fight them in Iran? Would you fight them in Afghanistan? Will you fight them here or there? Will you fight them anywhere? Would you fight Al Queda if they bomb our trains? Would you fight Al Queda if they hijack our planes? Will you fight them like a mouse? Or will you just fight the White House? Would you fight them with General Petraeus? Or will you just let Al Queda slay us? Where will you fight Al Queda Harry Reid? Will you fight them in our malls? Would you fight them in school halls? Will you fight Al Queda at all? Or just let the President's plans stall? Would you put our heads on the chopping block? And let Al Queda lop them off? Are you here to play political games? Do you not care if the country goes up in flames? 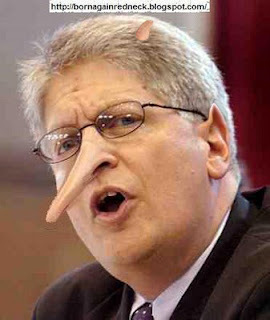 Will you gut the Patriot Act and wait until we next get whacked? Have you gone so far 'round the bend that you cannot give Iraq a chance to mend? When will you learn? What will you do? How will you keep us safe? Do you have a clue? Answer us please as time grows short. Al Queda is coming and we need a report. Now, that is food for thought. NOTE: This is the updated version. Thanks Mike! For more than 19 years my parents have had a cat by the name of Velcro. Velcro got its name because it would stick to us like "velcro" and made the sound of it when we pulled him off. Velcro was born in 1987. We cannot remember exactly when he was born, but we know that it was between summer of 1987 and Thanksgiving of the same year. Velcro died today, April 23, 2007. 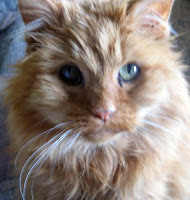 He had lived longer than any other cat they had owned and his health was deteriorating to the point that the only humane thing to do was to have him put to sleep. Velcro was an interesting cat. In his younger days he would make himself "available" to the grandkids in exchange for the good cat food. One of his favorite places to perch was on my sister's head--or anyone's head--but hers was his favorite. He loved to run his paws through human hair. Velcro sat on my son's head one day watching him eat a bowl of cereal. He had learned to say "Hello." It was sort of a "yewo." In his later years he thought he was on an equal with my youngest brother of about the same age. In fact my brother is just slightly younger than this cat. Velcro and my brother had a rather interesting sibling rivalry. My brother would complain that the cat would not stay out of his room. "Mom," he would say, "would you tell Velcro to stay out of my room while I am at school." In turn, Velcro would sneak into the room any chance he got, just because he could. I am sure there are many stories that will be told about this cat for years to come. He will be missed. Okay, so I like to take the occasional silly quiz. This one perked my interest because I like to play Dungeons and Dragons. In this game it is very important to know ones alignment--not talking about tire alignment here. as a good person is expected or required to act. They are dedicated to upholding both what is right and what is set down in law. I was looking for a little light, comic relief, sort of thing today and found this little pass-a-long quiz. I have always said that I am a Realist. I can be optimistic if the situation calls for it. But I also see the down side of things with open eyes. You don't see the glass as half empty or half full. You see what's exactly in the glass. This man, who was a living memory of the horror of the Holocaust, is now a hero to many of those who survived Monday's tragedy at Va Tech. We should take care not to place blame on those who have come to this country from other parts of the world. Yes, the gunman was a foreigner, but so was one of the heros. As the talk continues the day after the massacre at Va Tech many people are looking for reasons and something to blame. I was over at Eeps, Meeps and Ipes blog. I read something I have heard before following tragedies like this. I work in an office environment and this case was all the talk of the office after lunch. Sadly one of my coworkers immediately launched into a tirade about how all of these school shootings and violence in our youth is directly related to "those violent video games". If it weren't for video games you know that no one in the highly civilized United States would lash out and try to injure their fellow beings. I, of course, jumped in and told him there was no proof that violent video games caused such behaviors any more than playing cops and robbers with fake guns or fingers did. His comment, "I don't need proof, we all know these things. "Excuse me? We all know this? What -we-?" So often we jump to conclusions about the cause of the world's ills. We want quick fixes. Getting rid of video games might be a quick fix--or not. But it certainly would not solve the problem. The problem is much more complex. There are many things that have lead up to a decision by the young 23 year old Va Tech student to gather some ammunition and open fire. We all want to know why. That is human nature. We want to know how to prevent this from happening in the future. But we would best be served by learning the facts rather than jumping to conclusions based on our pet peeves--whether they be video games or something else that gets our goat. Virginia Tech brings back memories for me. The campus is in the small town of Blacksburg in Montgomery County, Virginia. I spent the summer and fall of 1988 living in neighboring Giles County. We would occasionally spend our off days on the tennis courts on campus. Word just reached me of the horrible news at this beautiful campus. BLACKSBURG, Va. — "A gunman opened fire in a Virginia Tech dorm and then, two hours later, in a classroom across campus Monday, killing at least 30 people in the deadliest shooting rampage in U.S. history, government officials told The Associated Press. The gunman was killed, bringing the death toll to 31. "Today the university was struck with a tragedy that we consider of monumental proportions," said Virginia Tech president Charles Steger. "The university is shocked and indeed horrified." It was not immediately clear whether the gunman was shot by police or took his own life. Investigators offered no motive for the attack. The gunman's name was not immediately released, and it was not known if he was a student. My heart and prayers go out to the families and those who witnessed this tragedy. I want to reference what Patrck Conlon said about this tragedy on his blog at Born Again Redneck Yogi. "When guns are outlawed, only outlaws will have guns." "To most people, it makes sense that General Motors can't be held responsible for the actions of drunk drivers, or that Louisville Slugger shouldn't be sued if a criminal uses one of their bats to assault someone. To some trial lawyers and social activists, however, this logic does not apply to firearms dealers and manufacturers." I recently joked about the Swiss Army and their inability to keep their own borders straight. Nanc commented on that post about why the Swiss would even need an army since they are a neutral nation. Think about this. If Switzerland had no army at all would they even remain a country at all? Would the United States be able to remain sovereign if it was unable to defend itself. The right to defend oneself is intrinsic whether they are a great nation or an individual. 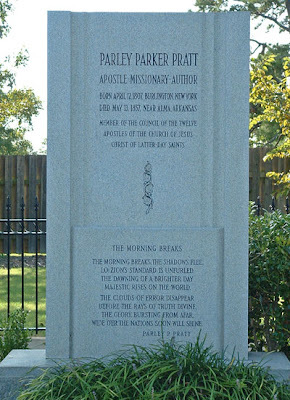 On May 13, 1857 my husband's 3rd Great Grandfather, Parley Parker Pratt, was killed near Van Buren, Arkansas. While on his mission, Parley sensed his approaching death. He wrote home, “I long to do my duty while here and then go to rest in the paradise of God.” Indeed, Parley stated, “I neither dread nor fear death, but I anticipate changing worlds with joy inexhaustible.” In May 1857, shortly after his 50th birthday, Parley was murdered outside the small town of Van Buren, Arkansas. Many things, both good and ill have been written about Parley Pratt. But there is no doubt that he was not an ordinary man. His legacy lives to this day. In the mountains to the east of Salt Lake City there is a canyon that bears his name. I-80 East from the Salt Lake Valley climbs through this Parley's Canyon. In November 1849, after suspending work on his road for a season, Pratt was called to head an exploring company of fifty men to southern Utah and to counsel Brigham Young on promising areas for new settlements. Pratt gave to the legislative assembly optimistic forecasts for settling the present sites of Richfield, Marysvale, Parowan, Cedar City, Washington, Santa Clara, Mountain Meadow, Beaver, and Payson. His company brought back samples of iron ore, coal, and other minerals. He provided specific information on weather, soil conditions, water, forestation, and other topographical conditions. He was a poet, song writer. 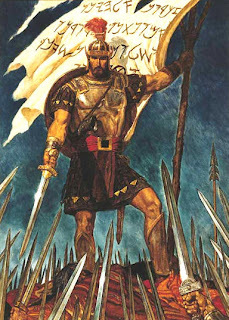 Seven of his songs are currently included in the LDS Hymn Book. In the old historic Nauvoo, Illinois there is a street bearing his name. It was along this street which runs west to east toward the Mississippi River that most of the early Mormons last saw their beautiful town. Parley's Street became known as the Trails of Tears (later to be renamed the Trail of Faith). As the Mormons were being driven from their homes in February 1846 they followed this road to the River and on to the west. A Note: Two of his descendents have run for President of the United States. George Romney was a candidate for the Republican presidential nomination in 1968, losing to Richard Nixon and his son Mitt Romney who is currently in the running for the same nomination. Power: The ability or official capacity to exercise control; authority. such as a state or an organization. So then, what is "abuse of power"? ABUSE OF POWER is the illegitimate use of power. Most of the country is familiar with the case of the former Durham County DA who illegally held back DNA evidence that would clear Duke Lacrosse players in the case against them. In some discussions on Born Again Redneck Yogi I came into a challenge to "improve" on an already "improved" upon image of the said DA. And so, this photo of Nifong went from an enlongated nose to the addition of pointed ears and horns. UPDATE: Here are bigger horns. For those who have seen my website you might recognize the new look for my blog. I have integrated them to have the same look. I figured out how to do this while helping a friend redo the look for her blog. Bear with me if we find a bug or two.